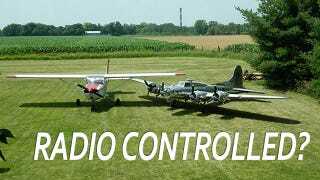 Would You Fly In A Radio Controlled Airplane? This 1/3 scale B-17 replica has a 34 ft wingspan and sports four 60 hp engines for a total of 240 hp. Here's the catch... its not R/C! Jack Bally has spent approximately 20,000 hours dedicated to building this 1,800 pound, one-of-a-kind, homebuilt aircraft, and plans to strap himself in and go flying. The scratch built aluminum airframe features retractable landing gear and is powered by four Hirth 3002 4-cylinder 2-stroke air cooled engines. A homebuilt mold and vacuum system was designed to craft the plexiglass nosecone and strutural testing estimates the design will be good for 6 positive and negative g's. Originally planned as a scaled B-24 Liberator but was switched to a B-17 Flying Fortress because it had the potential to make a more accurate replica. With only a set of 1/9 scale model airplane plans, big dreams, and a whole lot of ingenuity, Bally has created on insane awesome airplane. Would y0u have the cohones to fly in this thing?